Mosquitoes love warm, wet weather. Spring is their favorite season! But you won’t always be able to hide behind a tastier friend. We’re on the cusp of summer, which is a great time to think about protecting your skin from the sun. 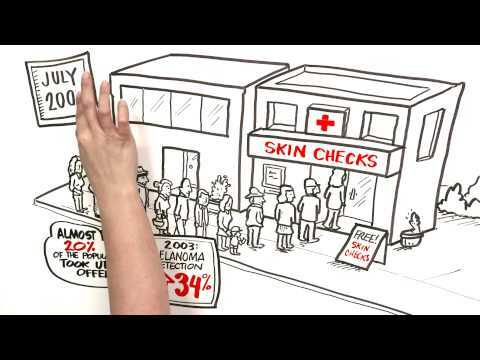 More than 4 million people are diagnosed with some form of skin cancer every year in the US. Damage from ultraviolet (UV) radiation is responsible for the majority of cases. Most of the headlines over the last few days have focused on the arctic “cyclone” and brutally cold temperatures affecting a big chunk of the US. Low temperature records are being shattered. Many states are reporting wind chills of -30°F or less. That’s not just cold—that’s life threatening. Outside my house, in Seattle, the weather is a pretty seasonal 40°F. And rainy. Lucky us. It’s only 8 minutes long, but packed full of information. Over the weekend, I discovered I had a minor case of athlete’s foot. I’m no athlete, but note to self: wear flip-flops when taking a shower at the gym! I couldn’t find a tube of antifungal cream in my medicine cabinet—it’s been years since anyone in my family has needed it—so I went out to buy one. On a cloudy summer day it’s easy to forget that the sun’s skin-damaging ultraviolet or UV rays aren’t blocked by the clouds. We still have to use sunscreen, wear hats and sunglasses, or stay out of the sun to protect ourselves. Related post: Be informed—What is SPF? Many years ago I had a primary care doctor who used to perform a total body skin examination (TBSE) on me every year as part of my annual exam. Of course, those all-inclusive physicals are a thing of the past. I haven’t had a physician perform a TBSE for a long time. Just in time for spring and summer fun in the sun, the results of a large and long-term study on the hazards of avoiding the sun were published last week in the Journal of Internal Medicine. Usually all we hear about are the bad things about too much sun exposure—skin cancer, melanoma, wrinkles, sunburns, etc. As a child, I remember my mother declaring that of our entire family (2 adults and 4 kids) she was the only one who was pestered by mosquitoes when we were at our summer cabin by the lake. She felt understandably persecuted by the little blood-sucking menaces. And she probably was right.